Fees for the 2019 season: Dec 1/18 - Jan 31/19 $150; Feb 1-28/19 $200; after March 1/19 $250 (registration is complete once payment has been received). The game is played with 5 players and a goalie on the floor at a time. Teams are generally between 14-17 players. Boys and Girls play together at this age. 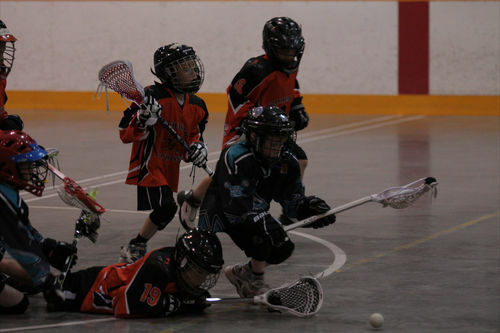 The tykes start in April and play until the end of June. We introduce the hard rubber lacrosse ball and play in tournaments. There will some travel at this age within neighbouring communities. This year we are running evaluations at Steveston Box in March 2017 with team formation by April. For Tyke there will be a minimum of 4 sessions and they must attend at least two sessions. As the evaluations go during Spring Break if you email your division coordinator and myself of the sessions that you will be missing and the reason, we can make arrangements for an additional session that your child can be looked at before the final placement is made. Coaches may make adjustments to their rosters in the first few weeks of the season and although we try and make as few as possible it can sometimes happen.